A big spike in unemployment is the latest sign that businesses are starting to feel the pinch from the weak economy. But some see hope on the horizon. 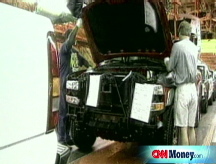 NEW YORK (CNNMoney.com) -- Businesses, like consumers, are starting to get much more nervous about the economy. The significant spike in the unemployment rate in May, coupled with another month of job losses, is a certain indication that businesses are feeling the need to cut costs. What's more, two separate reports about the health of Corporate America released today provide even more somber news about business confidence. Talkback: How much worse will the job market get? According to a survey of nearly 2,400 chief executive officers of small and mid-sized businesses by executive coaching firm Vistage International, CEO confidence is at an all-time low. "It is clear the state of the economy is factoring into stress levels for CEOs as more and more companies adjust their business plans in the United States to survive," said Rafael Pastor, Vistage's chairman and CEO in the report. "CEOs are telling us they are more stressed." But what's worrisome is how CEOs are dealing with this stress. According to the survey, only 43% of the CEOs said they now plan to increase their headcount in the next year. That's down from 57% a year ago. And one in six CEOs said they planned to cut jobs this year. Online recruiting firm Dice Holdings (DHX), which specializes in career Web sites geared toward the technology and financial services industries, issued a report with similarly gloomy forecasts this morning. Dice surveyed more than 1,100 companies and recruiters and found that more than half of the respondents said they would cut back their hiring plans over the next six months. And 20% said they thought layoffs were either very likely or likely at their companies in the next six months. "We're seeing a mixed and uncertain hiring environment," said Dice chairman and CEO Scot Melland in the report. "Roughly half of employers are sticking with their hiring plans, but with a degree of caution and hesitancy you might expect, given the lukewarm economy." Companies aren't just cutting back on hiring either. Executives in the Vistage survey said they also plan on investing less in their businesses, another troubling sign. Only 33% of the CEOs said they would boost spending on new plants and equipment, compared to 46% from a year ago. This is particularly problematic since the Federal Reserve's series of interest rate cuts since last September, in theory, should help make credit more available for businesses that want to grow. That doesn't appear to be happening just yet though. "Despite declines in market interest rates, firms are finding it more difficult to obtain financing," the Vistage report indicated. That said, there are some bright spots amid the gloom. According to the Dice survey, 52% of new hires are receiving salaries that are higher than a year ago while 45% of new hires are getting paid about the same. That's a good sign. Given how rapidly food and gas prices rising, it's crucial that workers continue to see wage increases. "The weakness in the employment market is not impacting compensation. In many categories, this still is a tight labor market and companies realize they have to pay competitive wages and take into account the cost of living," Melland said in an interview. In addition, nearly 60% of those surveyed by Dice said that the main reason it's taking them longer to fill positions is because it's harder to find qualified candidates, not because they are cutting back due to the economy. "Interestingly, the major reason for the extended period to hire people isn't concern about the economy or a lack of urgency to fill a position. It's finding the right people," the Dice report said. And according to Vistage's Pastor, he said more and more small and mid-sized businesses are increasing their businesses abroad, lured by a weaker dollar, stronger growth overseas and the relative ease of reaching international customers via the Web. Along those lines, many large multinational corporations have been holding up reasonably well because they have stronger growth opportunities outside of the United States. Plus, many of them have relatively low debt loads and lots of cash to keep them afloat. Pastor also said that corporate confidence, while low, is not declining precipitously. He said this may suggest that CEOs think the economy, while not ready yet to turn a corner, is not going to plunge significantly from here. The executives surveyed by Dice shared that sentiment. "The majority of companies do not appear to be forecasting a dire turn for the worse any time soon," Melland said in the report. Gas prices have climbed to record levels. Are you feeling the pinch? Tell us how gas prices are affecting you and what you're doing to cope. Send us your photos and videos, or email us and tell us what you think.